Brooks Brothers. Two Piece, Two button, Fully Lined, Single Vent Suit. Gray – See Photo’s. Inseam: 28” (There pants can be lengthened 1.5”). Length (Bottom of Collar to Hem ): 31”. Pit to Pit ( Across Chest ): 23”. Cuff Height (height of cuff) N/A. Inseam (crotch to cuff) 28.125" (2" to let out). Waist (laid flat) 17.75". Condition- 10/10, jacket and pants are in great condition with no signs of wear. Color- Black with stripes. Sleeve Length- 25.5". Length- 32". Shoulder to shoulder- 20". Vest: (if applicable). Material: wool. Pants front: flat. Labeled Size: 40. Inseam length: 28". Length from bottom of collar: 31". Sleeve length from shoulder seam: 24.5". Full length from backside. Inseam (crotch to cuff) 27.875". Waist (laid flat) 17.50". Material: 100% Wool. Sleeves(Top of Shoulder to Cuff ) 25". Shoulder : 18.5". Inseam : 28". Pit to Pit(Across Chest ): 21". Jos A Bank. Gray Striped 2 Button Suit. Pants Waist - 18". Pants Inseam - 28.5". Size: 42 Regular. Waist (above the pockets) - 21". Brooks Brothers Fitzgerald Gray Suit Size 44 R. Smooth wool. Fabric Pattern: Striped. Fabric Composition: 100% Wool. Suit Details Chest - 46". Main Color: Gray. Two Button Single Breasted Front Closure. Inseam (crotch to cuff) 28.375". Waist (laid flat) 18.25". NAVY CHALK- LINED PATTERN. POLO RALPH LAUREN. THIS SUIT IS IN EXCELLENT CONDITION WITH NO HOLES OR SNAGS. SEE PICTURES FOR DETAILS AND CONDITION. VENTS: CENTER BACK. CUFFED HEM. EXCELLENT USED CONDITION. Brooks Brothers Blue Striped Wool Suit Size 38 R. Classic stripe pattern. Fabric Composition: 100% Wool. Fabric Pattern: Striped. Suit Details Main Color: Navy Blue. Waist - 38". Two Button single breasted Front Closure. Fabric: 100% Super 130's Wool. Pattern: Stripe. Pant Waist: 35". Condition: Right side chest under chest pocket there's a bump in the canvas, Other than that Mint. Color: Navy. Pant Lining: Front lined to the knees. Color : Navy Blue. Four Interior Pockets. Four Faux Buttons on the cuffs. Two Button Single Breasted. Three Exterior Pockets. What good is a great deal if it's on a knockoff?. Two Back Pockets. Maybe you're not a millionaire, but at least you can be just as well-dressed. Notes: tailored by Attolini for Luciano Barbera Sartoriale Line. Material: Wool. Pants front: Pleated. Labeled Size: Eu 50 - US 40. Inseam length: 28”. Across waist: 17”. Across waist: 20”. Pit to pit: 21.5”. Inseam (crotch to cuff) 27.875". Waist (laid flat) 18.25". Inseam (crotch to cuff) 28.00". Waist (laid flat) 19.125". Condition: Pre-owned. I try to be as thorough as possible in my photographing. Inseam (crotch to cuff) 28.25". Waist (laid flat) 19.125". This is a Pre Owned Donald J Trump Luxury Separates 46R 2pc Suit. 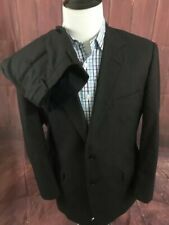 This Donald J Trump Luxury Separates 46R 2pc Suit is in Like New Condition. Jacket Size 46R. Pin Striped. Two Button. Classic Fit. they will be clearly described in the section marked (Condition). Inseam (crotch to cuff) 27.50 (2.00" to let out). Waist (laid flat) 16.75". Suit is in good pre-owned condition! Chest: 22". Single Vent. Waist : 21". Two flap hip pockets & chest pocket. Made in USA. We are here to service you. Waist : 17.5". Inseam (crotch to cuff) 28.00". Waist (laid flat) 17.50". Inseam (crotch to cuff) 28.00". Waist (laid flat) 19.50". Armpit to Armpit: 22". Inseam: 28". Shoulders: 19". Waist width: 17". --Excellent condition, no apparent wear. Length (Neck to Hem): 32.5". Trouser Waist: 36" / 1.5" extra to let out. Jacket Waist: 45" (narrowest point - usually near the top button x 2). Chest: 49"(armpit to armpit, widest point x 2). Inseam: 28" / 2.5" extra to let out. Shoulder: 21". Inseam (crotch to cuff) 28.125" (2.5" to let out). Waist (laid flat) 16.00". Inseam (crotch to cuff) 28.125". Waist (laid flat) 18.25". Suit is pre-owned in nice wearable condition. Dark Gray with mini herringbone tone on tone, 100% wool, slightly thicker fabric, made in Italy. Shoulder seam to shoulder seam 20". Classic single breasted 3 button closure with dual vents, fully lined, trousers style is plated front (Double pleats) and traditional cuff bottoms. Sleeve length: 24" (0.75" to let out). Jacket length: 30.5". Like new condition. Inseam: 28" (1" to let out). Waist: 42" (1" to let out). Inseam (crotch to cuff) 28.25". Waist (laid flat) 18.25". Note this may be altered from the original 44R size. Here's a sharp suit from Brooks Brothers. Pants waistband 32". Pants inseam 28". Doing that is against U.S. and international laws. Shoulder to cuff 25.5". A two piece light gray pin striped suit. Both pieces are fully lined. Composition: 100% Wool. JOS A BANK Signature Gold 42R Navy Blue Striped Pick Stitch 2 Btn Wool Suit 36"
JOS A BANK Navy Blue Pinstriped 2 Button Blazer. Excellent quality Jos. A. Bank. signature gold series suit. This is in great condition and is an amazing looking suit. Features pick stitching on lapels and pockets. ISAIA NAPOLI. FREE Trial! PANTS SIZE 36 X 28. SIZE 40 REGULAR. MADE IN CANADA. 100% AUTHENTIC OR YOUR MONEY BACK. Inseam (crotch to cuff) 28.25" (2" to let out). Waist (laid flat) 20.25". NERVESA Olive Pinstripe Suit Jacket Pants 100% Wool Made in Italy Pleated Pants. Pants: pleated front, no cuff. Waist: 36". Pit to pit across back: 26". No flap, solid back. Inseam (crotch to cuff) 27.50" (1.50" to let out). Waist (laid flat) 19.75". Inseam (crotch to cuff) 28.25". Waist (laid flat) 17.375".